'Cleared For Takeoff' (Schreiner, R. 2011). Seedling# SS 41A. TB, 37 (94 cm), Early midseason bloom. 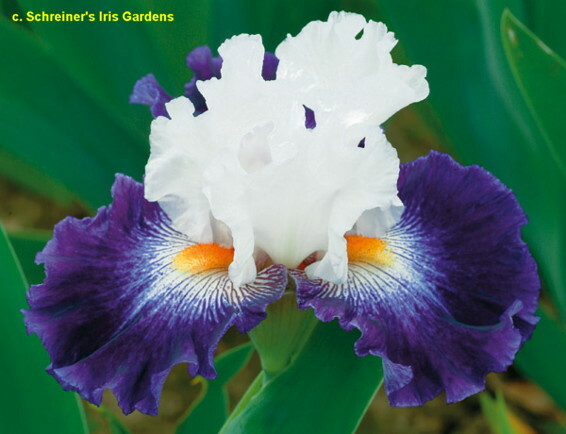 Standards and style arms white (RHS 155D); falls dark inky blue-purple (89A), white starburst by tangerine beards. Seedling# CC 1466-B: (seedling# AA 1315-B: ('Gypsy Woman' x seedling# Y 149-1: (seedling# R 329-K, 'Gypsy Woman' sibling x Nearpass seedling# 81-11: (('Touché' x ('Country Music' x 'Lady Of Loudoun')) x 'Sea of Stars'))) x 'Gypsy Woman') X seedling# LL 79-1: (seedling# FF 527-B, 'World Premier' sibling x seedling# GG 193-1: ('Velvet Ballerina' x seedling# BB 11-A: ('Ride The Wind' x 'Pledge Allegiance'))). Schreiner 2011.